The future of Canada's automotive industry is not about horsepower, “it’s about software power,” says federal Minister of Economic Development, Navdeep Bains. That was the message for the country’s auto sector when he sat down with Automotive News Canada in an exclusive interview March 31. Bains has spent much of the first year of the Liberal government’s mandate touting innovation as the best way to keep automotive investment coming into Canada. He said he sees no new investment by any automaker in the short term, and that’s why he’s focused on the technological advancements of the future. “People think of the automotive sector very much in the context of the past,” Bains said. “I think it represents a very bright future in terms of connectivity, mobility, technology and innovation jobs. In the last year alone, General Motors has opened a technology centre in Markham, Ont., and is still filling about 1,000 engineering positions; BlackBerry opened a self-driving research centre in Ottawa; and in March, Ford announced it would spend $500 million on its own research-and-engineering centre in Ottawa and hire 300 software engineers in Ontario. The federal government has pledged up to $102 mil-lion to Ford’s efforts, which also include a new $600-million engine program at its Essex Engine Plant in Windsor, Ont. “Certainly, the partnership with government helped but it’s not exclusively that,” Ford’s president of the Americas, Joe Hinrichs, said about the automaker’s investment in engineering. Ford also had the chance to hire about 400 former BlackBerry software engineers in Ontario. Bains said the federal government is working with “a partnership model” between government and business. He said Canada can be a marquee customer of automakers and at the same time provide them financial assistance. Bains said the government is looking for companies big and small that promote technology adoption, create jobs and work in research and development. Those companies can now draw from a $1.26-billion Strategic Innovation Fund that was announced in the 2017 federal budget, March 21. It rolls several programs — including the previous $500-million Automotive Innovation Fund and the $100-million Automotive Supplier Innovation Fund — into one large pool of money. Details will be released later, but Bains insists it makes more money available to more companies and all approvals will be merit based. “Who’s bringing the best value proposition for Canada?” he said. The budget also calls for the creation of a small number of business-led innovation “superclusters” that will focus on innovative industries. Canada’s universities consistently “punch well above their weight” in terms of research and publications. But they need help in getting their research, ideas and innovation to market. He thinks the superclusters can do that. “We think we (government) can and should play a role,” he said. APMA President Flavio Volpe likes the focus on super-clusters and innovation. “The emerging technology cluster in automotive, from that Toronto-to-Waterloo corridor and maybe Ottawa exclusively, is world class,” he said. Bains said he wants to promote research and development not only at research centres, but also on the shop floors of automakers and suppliers. The auto industry is worth $18 billion to the Canadian economy, Bains said, and it employs 500,000 people directly and indirectly. “If we want to grow the economy we have to make sure we focus on suppliers as well,” he said. 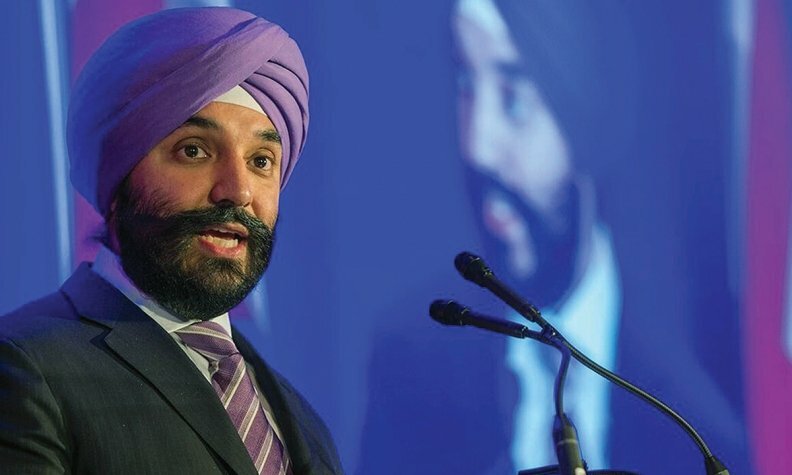 Many of those Canadian-based supply companies also have operations in the United States, so Bains wants to promote the interconnectedness of the auto industry. R&D competition is global, Bains said. His staff has studied and researched the competition in looking for what works best.